The leading-edge laser science provides treatment versatility, precise influence and pulse control needed to treat the most difficult cases. 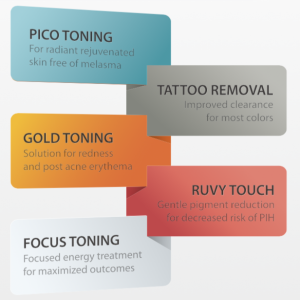 During the Pico Toning procedure, laser energy penetrates deep within your tissue in order to effect changes and use your own bodies natural healing to improve the look of your skin. The laser energy will reduce appearance of pigment, increase the collagen and elastin therefore reducing wrinkles and even out tone and texture. The PicoPlus treatment is very gentle and, as a result, multiple passes can be used to effectively and safely treat deep within the skin. What are the benefits of PicoPlus? PicoPlus is also safer, faster and more effective compared to earlier generation of skin laser. PicoPlus is able to breakdown pigments into finer particles. With each light pulse delivered at a rate faster, each treatment session can be completed faster and more effectively. The treatment downtime on the PicoPlus is also lessened. What conditions does PicoPlus treat? With 4 wavelengths, PicoPlus is able to treat multiple conditions which include pigmentation, acne scars, wrinkles and tattoo removal. In order to insure the safest treatment, your doctor may require multiple sessions to produce effective and long-lasting results. The number of sessions required depends on the severity of your condition and your treatment goals. Your physician will recommend a treatment course that is right for you. Your physician will discuss the number of treatments required to meet your treatment needs. With minimal downtime and low incidence of side effects, you may immediately return to your daily activities. Ask doctor about schedule your PicoPlus procedure today. The majority of patients report almost no pain, only experience a slight warming of their skin and a light prickling feeling. Typically, no anaesthesia pr topical is needed. 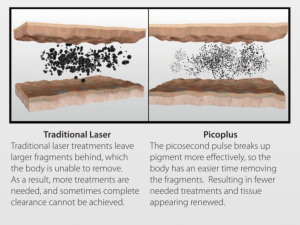 How is PicoPlus treatment different from traditional lasers? PicoPlus delivers laser in picosecond duration which is 1000 times shorter than traditional lasers in nanosecond duration. When delivering laser beam in much shorter duration, pigmented lesion and tattoos are removed much better, and side-effects are far minimised.